Gorakhpur is a city known to have great historical and cultural value. As generations come and go, it becomes ever more important that the rich past of this region be preserved and treasured. A number of museums have been established under the aegis of the Government of Uttar Pradesh, to preserve and maintain historical and archaeological discoveries. Also archived in these museums are chronologies and histories of various establishments and cultures as they are today, so that one can see how these evolved. Elaborated below are details on the different museums in Gorakhpur. Stop off at one of these during your visit to this city to enjoy the whole, rich and vibrant past of India, unblemished by the passage of time. Established in 1957, the Purvayatana Archaeological Museum of Gorakhpur is a huge attraction for tourists from across India. It is managed by the University of Gorakhpur, and more precisely, the Department of Ancient Indian History, Archaeology and Culture. This museum is a treasure trove of historical artefacts and archaeological finds, and a visit here will take you back to all the forgotten eras of the past, leaving you with an unmatched view of India’s rich culture. Attractions: Historical artefacts including sculptures, coins, coin casts, casts of sculptures, stumpages, photographs, pottery, beads and stone tools. Location: This museum bears the distinction of lying within the campus of the University of Gorakhpur. Timings: 10:00 AM to 4:30 PM. Holidays: Sundays, Public Holidays and University Holidays. The State’s Commerce University, along Gorakhpur University’s Department of Commerce, runs the Commerce Museum, which is more of an educational museum. The primary purpose of this museum is related to the enhancement and focus of education in Gorakhpur and its surrounding regions. Established in 1969, this museum assists in providing students of commerce with practical knowledge of the subject, as well as uplifting education in the region. Attractions: Educational charts, pictures, graphs, samples and photo-specimen that relate to education and knowledge sharing. There are periodic film shows that feature the aim of the museum more fully. Location: This museum is located within the campus of the University of Gorakhpur. If you delight in reveling in the glories of India’s historical past, then the Puratatva Sanghralaya is the ideal museum to visit. This is an archaeological museum that features ancient manuscripts, documents, sculptures and the like. It is a treasure trove of delights to historians as well as anyone who loves delving into the past and studying the evolution of culture and society with the passage of time. Attractions: Terracotta items, sculptures, figurines, art, beads, ancient manuscripts and documents. There are also documentaries that are especially screened to highlight the archaeological and historical relevance of all that is showcased in this museum. Location: This museum is located on the premises of the Rahul Sanskritayan Sansthan. Timings: 9:00 AM to 7:30 PM. Holidays: Mondays and Public Holidays. 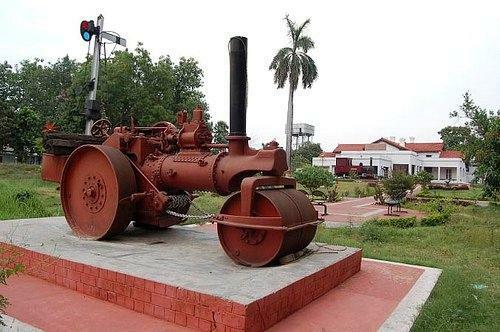 Gorakhpur is the headquarters of the North Eastern Railways and this city boasts of the Railway Museum to showcase this segment of the city’s development. Inaugurated in 2007, this museum will give you a tour through time of the various stages of development of these railways, and how its network expanded to be what it is today. Attractions: Relics and memoirs of everything related to the North Eastern Railway, from its time of inception. Enjoy looking at Lord Lawrence’s Steam Engine from 1874 which was brought by sea from London. There is also the gallery that will take you back in time to yester-years and see railway relics of by-gone times and their various development stages. The toy train ride is also an attraction if you are visiting with kids. Location: No. 5, Railway Colony, Near Railway Golf Course. Timings: 12 Noon to 9:00 PM. Entrance Fees: Rs. 5 to enter. Rs. 10 to use the toy train for children up to 12 years of age. Another great museum to visit on a trip to Gorakhpur is the Buddha Museum. Located in Kushinagar, a short distance out of the city itself, this museum is a place in which all relics related to Gautam Buddha are preserved. While the museum itself was conceptualised in 1987, the present building came into existence a decade later. Attractions: Over 3,500 antiques, paintings and relics. Cultural exhibits related to the Buddha are also documented and displayed. There are a number of stone and bronze sculptures as well as pottery, terracotta and metal objects. Many manuscripts, paintings, photographs and postal stamps are preserved here. The museum itself is a perfect example of Buddhist architectural style preserved through the years. Location: This museum is located in the Ramgarh Tal project area, around 5 kilometers away from the city center. Timings: 10:00 AM t0 5:00 PM. Holidays: Monday, every second Sunday, and Public Holidays. The Zoological Museum of Gorakhpur was established in 1958 with an aim to preserve the zoological kingdom and its history for current and future generations. It is managed by the University of Gorakhpur, and is aided by the Government of Gorakhpur. Attractions: Rare animals, all major vertebrates, invertebrates and phyla. There is a guided tour of the museum and film shows that highlight the zoological kingdom. Location: This museum is located on the campus of the University of Gorakhpur. Timings: 9:50 AM to 4:30 PM. Holidays: Sundays and Public Holidays.